Is everyone ready to start a new year yet? I’ve been trying to get everything clean and in there places, which includes my recipe archives. These are my last two recipes that have been just sitting on my computer begging to get posted. So these will be my last posts before applying my New Years resolution to my recipes. Goal: Perfect my cooking skills and start cooking new dinner recipes on a regular basis. But!! Don’t fret all you goodies fans. I will still be giving myself permission to bake, at least once a week, but I really want to post a lot more dinner recipes. So lots of yummies coming in the future (just maybe a lower calorie version of it). All this New Years resolution talk has got me curious though. If you feel up to sharing… What are your resolutions for the year of 2012? Mine are, 1) Obviously, cooking more instead of baking. 2) Running this Ragnar (which my leg just got bumped up to 22.6 miles… yeah, I’m a little nerves. ), but along with that, actually maintaining staying in shape, and maybe running a 1/2 marathon. I really haven’t committed to that one whole heartedly yet. But we’ll see. 3) This is probably a little unrealistic, but I would really love to get down to 120-125 lb. Which means, after all of this holiday pigging out, I have 10-15 pounds to go. And last but not least. 4) I really wanna strengthen my relationship with my Heavenly Father. I have really let slide my scripture study, prayers, etc. So, those are my goals. Wish me luck. 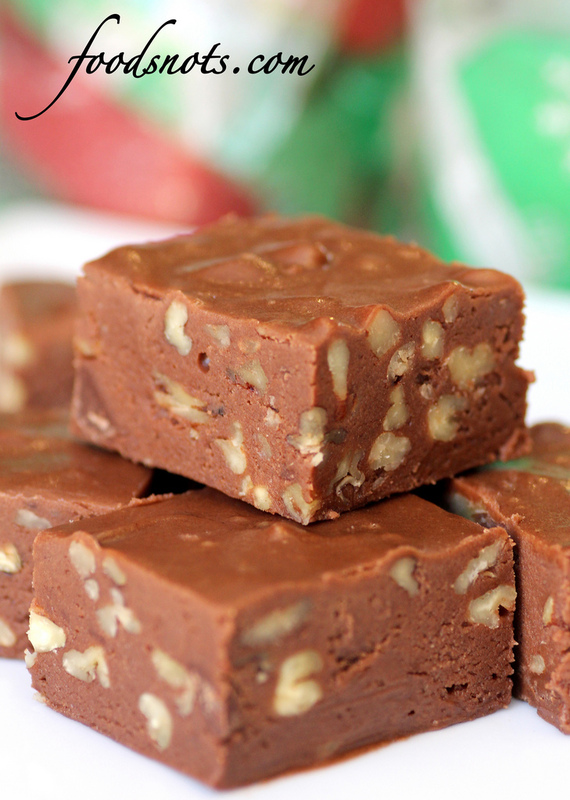 Oh and by the way these fudge recipes are amazing!! Love love love love love them!!! This Chocolate Marshmallow Fudge is seriously one of the best chocolate fudge recipes I’ve ever had. It’s a little hard to work with unless it’s cold cause it doesn’t set as firm as traditional chocolate fudge, but it melts in your mouth and has such an amazing flavor. It’s simply amazing, and the Marbled Orange Fudge taste exactly like a orange cream popsicle. Yum!! Enjoy and Happy New Year!! To toast nuts: Preheat oven to 350 degrees F and place rack in center of oven. Place the pecans or walnuts on a baking sheet and tast the nuts or about 8 minutes, or until lightly brown and fragrant. Cool and then chop coarsely. Chocolate Marshmallow Fudge: First line the bottom and sides of an 9 x 9 x 2 inch pan with aluminum foil. Remove the saucepan from the heat and add the chocolate chips, stirring until the chocolate has melted and the mixture is smooth (can use a wooden spoon or a wire whisk). Stir in the toasted nuts and vanilla extract. Immediately pour the fudge into the prepared pan and smooth the top. Let stand at room temperature until cool. Carefully remove the fudge from the pan by lifting the edges of the foil. With a long, sharp knife cut the fudge into one inch pieces. Store in the refrigerator for several days or freeze, well wrapped, for several months. Let thaw at room temperature, unwrapped, for a few hours before serving. Yield: about 81 – one inch pieces of fudge.